A key element of the Wireless Innovation Forum's strategy is to maintain strong relationships with "partner" organizations, including both standards bodies and other industry consortia, to support the needs of our members. In advancing this strategy, the goal of the Wireless Innovation Forum is to collaborate, not compete, with partner organizations having overlapping interests, establishing the Wireless Innovation Forum as a single location where members can go to interact with a wide range of relevant third-party organizations. The CBRS Alliance believes that LTE-based solutions in the CBRS band, utilizing shared spectrum, can enable both in-building and outdoor coverage and capacity expansion at massive scale. In order to maximize CBRS' full potential, the CBRS Alliance aims to enable a robust ecosystem towards making LTE-based CBRS solutions available. The mission of the CBRS Alliance is to evangelize LTE-based CBRS technology, use cases and business opportunities while simultaneously driving technology developments necessary to fulfill the mission, including multi-operator LTE capabilities. The Alliance will also establish an effective product certification program for LTE equipment in the US 3.5 GHz band ensuring multi-vendor interoperability. The Forum has a mutually beneficial cooperation agreement aimed at establishing an ecosystem focused on commercializing the 3.5 GHz Citizen’s Broadband Radio Service (CBRS) Band with the CBRS Alliance. Per the agreement, the groups will extend mutual invitations to provide input contributions and comments, possibly hold joint workshop and meetings, share their roadmaps and planning schedules and nominate observers to sit on committees that are applicable to their shared interests. Through these opportunities, the groups aim to reduce any duplication of work, create better end products by introducing additional ideas and insight, and more robustly advocate for and promote commercialization of the Band. OCCAR was created in 1998 with the aim of providing more effective and efficient arrangements for the management of certain existing and future cooperative armament programs. The main scope of the ESSOR project is to provide architecture of Software Defined Radio (SDR) for military purposes and a military High Data Waveform (HDR WF) compliant with such architecture, thus offering the normative referential required for development and production of software radios in Europe. OCCAR ESSOR Programme participating states include the Republic of Finland, the French Republic, the Italian Republic, the Republic of Poland, the Kingdom of Spain and the Kingdom of Sweden. The ESSOR products are based on SCA. OCCAR, on behalf of the ESSOR Participating States, signed on 12 January 2016 an agreement with the Wireless Innovation Forum for the exchange of information in order to support the harmonization of the Software Communications Architecture (SCA) standards at an international level. The Joint Tactical Networking Center (JTNC) is an organization of the United States Department of Defense with responsibilities that include the design, maintenance, and development of software standards in order to maximize open architecture development, enhance network security, assure operational readiness, and promote portability. Within The Joint Tactical Networking Center (JTNC) is an organization of the United States Department of Defense with responsibilities that include the design, maintenance, and development of software standards in order to maximize open architecture development, enhance network security, assure operational readiness, and promote portability. Within the JTNC, the Standards Interface Control Working Group (JTNC Standards ICWG) supports efforts including the oversight and implementation of the Software Communications Architecture (SCA) and Application Program Interfaces (APls) standard sets the JTNC, the Standards Interface Control Working Group (JTNC Standards ICWG) supports efforts including the oversight and implementation of the Software Communications Architecture (SCA) and Application Program Interfaces (APls) standard sets. The Wireless Innovation Forum has a memorandum of understanding (available upon request) with the JTNC to allow collaboration between the two organizations. The IEEE is a leading developer of standards that underpin many of today's technologies. Their standards are developed in a unique environment that builds consensus in an open process based on input from all interested parties. With nearly 1,300 standards either completed or under development, we are a central source of standardization in both traditional and emerging fields, particularly telecommunications, information technology and power generation. The Wireless Innovation Forum is a corporate member of the IEEE Standards Association. The Wireless Innovation Forum has a memorandum of understanding with IEEE Standard Association to allow collaboration between the two organizations. The Wireless Innovation Forum has established a relationship with the IEEE Communications Society(ComSoc): Information on membership, conferences, publications, online tutorials, webinars and new wireless certification program can be found at www.comsoc.org. The Object Management Group™ (OMG™) is an international, open membership, not-for-profit computer industry standards consortium. OMG member companies write, adopt, and maintain its standards following a mature, open process. OMG's standards include: Model Driven ArchitectureÂ® ,Unified Modeling Language™, and CORBAÂ®. The Wireless Innovation Forum is a member of the OMG and has made the OMG an Wireless Innovation Forum member to simplify collaboration between the two groups. The Wireless Innovation Forum has a Memorandum of Understanding allowing collaboration with the ETSI Technical Committee on Reconfigurable Radio Systems (TC RRS). The NCOIC is a unique collaboration of premier leaders in the aerospace, defense, information technology, large-scale integrator and services industries. The Consortium works in tandem with customers from around the world, each with a specific mission, to provide a set of tools that enable the development of network centric capabilities and products. 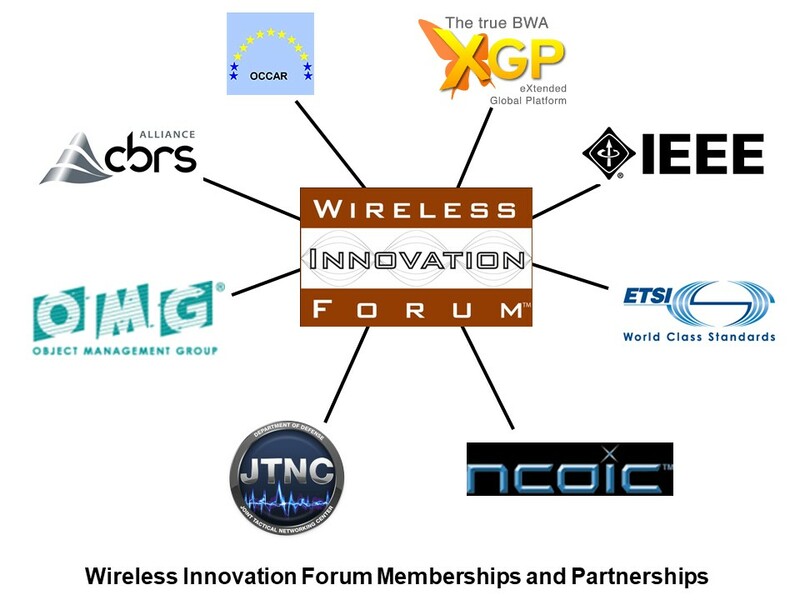 The Wireless Innovation Forum is a member of the NCOIC and has made the NCOIC an Wireless Innovation Forum member to simplify collaboration between the two groups. The primary mission of XGP Forum (XGPF) is to standardize and promote specification/services of XGP, an ITU approved 4G BWA TDD fully compatible with TD-LTE. In recent years, XGP Forum is actively engaged in activities to introduce a new private wireless system (sXGP system) using TD-LTE in 1.9 GHz band. XGPF and WInnF have a reciprocal interest in avoiding duplication of technical work and would both benefit from adopting a complementary approach to the standardization process. XGPF and WInnF have noted the necessity of structuring and strengthening their relationship and fostering closer cooperation, which is possible due to the general compatibility of their respective IPR policies.